Kenya Clothing - What clothes do Kenyans wear? On this page you’ll find information about traditional Kenya clothing. 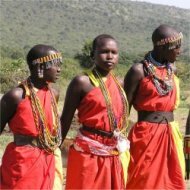 There's a seperate page about which clothes to wear in Kenya as a traveller. Most people agree there is no such thing as a ‘national Kenya clothing’. First of all, Kenya consists of over 70 ethnic groups (tribes) who all have different traditional dress styles. Secondly, the majority of Kenyans dress more or less Western style. Along the coast – for example in Mombasa or Lamu - where a big part of the population is Muslim, some also dress Arabic style. In fact, it has happened that Kenyan women who were supposed to represent their countries at international forums, bought traditional Nigerian clothes as they could not identify original Kenya clothing. There have been several attempts to create a national dress. Kenyan designers Mary Kadenge and Margaret Akumu Gould have been working on this for decades. Mrs Gould organised the first ever National Dress Competition in the 1980s in Nairobi. While she did not get much support then, she has now teamed up with the Kenya Tourism Foundation (KTF) and the Ministry of Culture and Social Services, who understand very well the advantage of having a national dress for national unity and PR purposes. However, some tribes have largely kept their traditional dress and life style. 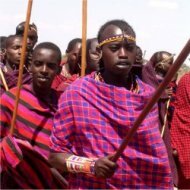 The Masai Maria (also spelled Maasai Mara) are the most famous, but this also goes for the Samburu (which are closely related to the Masai) and the Turkana peoples, who live in the north. Although even among these tribes, modernity is making it’s way, with traditionally dressed warriors carrying digital watches or sometimes even cell phones, to be able to receive tourists. Among the tribes who have typically adopted to Western life styles, are the Kikuyu from the highlands, the Akamba east of Nairobi, and the Luo in the west. Not coincidentally, especially the Kikuyu and secondly the Luo have the biggest political and economic influence in the country. Masai women typically wear vast plate-like bead necklaces, and colourful wraps called kanga. The men are famous for wearing a red-checked shuka (Maasai blanket) and carry a distinctive ball-ended club. For Masai, red clothing stands for power. Many Masai wear simple sandals, sometimes soled with pieces of motorcycle tires. When males become ‘morans’ (warriors), around age 14, they traditionally dye their hair red with ochre and fat.